- Leadership Theories - Custom Essay Writing Service UK for Your Academic Success! - Custom Essay Writing Service UK for Your Academic Success! This research presents an analysis of the proponents and criticisms of the main leadership theories. According to Storey (2004), the study of leadership in organisations has evolved through the years with changing theories of leadership and leadership development. Storey (2004) identifies the main theories as trait theory, behavioural theories, situational and contingency theories, exchange and path-goal models, new leadership (charismatic and transformational theories), constructivist theory, leadership with learning and post-charismatic and post-transformational theories. A summary of these theories is shown in table 1 (Appendix 1). The research is structured as follows: section one presents theories focusing on leader characteristics or traits including great man theory and trait theory; section two presents theories based on leader behaviour and situational models and section three presents the new leadership theories including transformational and transactional theories. According to Kirkpatrick and Locke (1991), great man leadership theories were popular in the 19th and early 20th centuries. Judge, Piccolo and Kosalka (2009: 855) state that the great man theory is attributed to Thomas Carlyle who proclaimed that “For, as I take it, Universal History, the history of what man has accomplished in this world, is at bottom the History of the Great Men who have worked here”. According to Eckmann (2005: 4), Carlyle’s argument was that heroes shape history through “the vision of their intellect, the beauty of their art, the prowess of their leadership and, most important, their divine inspiration.” Kirkpatrick and Locke (1991) state that great man theories were based on the assumption that leadership qualities were inherited, particularly by upper class men. In other words, these theories asserted that great men were born, not made (Hoffman et al., 2011). Vroom and Jago (2007) refer to heroic concepts of leadership which they argue emerged with the great man theory of history whereby major historical events were assumed to be the work of great men with vision and genius. Hoffman et al (2011: 349) argue that great man theories fell out of favour “amid questions as to the evidentiary basis underlying disposition-leadership associations”. Judge, Piccolo and Kosalka (2009) state that reviewers have labelled the approach as too simplistic, futile, dangerous and a product of self-delusion. Lieberson and O’Connor (1972: 117) also criticise great man theories for failing to consider a leader’s limits and state that “the evidence indicates that the influence of single individuals is seldom as decisive as the great-man theory would lead one to believe. Great man theories evolved into trait theories in the early 20th century (Judge et al., 2002; Kirkpatrick and Locke, 1991). Proponents of these theories argue that leaders possess traits or characteristics that make them different from other people and give them leadership advantage. This assumption that leadership depends on the qualities of the leader makes trait theories seem similar to great man theories but trait theories differ because they do not assume that leadership is limited to a few heroic men (Judge et al, 2002). Researchers however, have failed to agree on what traits are universal and trait theories suffer from a lack of “a structure in describing personality leading to a wide range of traits being investigated under different labels” (Judge et al, 2002: 766). For instance, Kirkpatrick and Locke (1991) argue that the six traits that distinguish leaders from non-leaders include drive, desire to lead, honesty/integrity, self-confidence, cognitive ability and business knowledge. On the other hand, House and Aditya (1997) propose four factors including achievement motivation, prosocial influence motivation, adjustment and self-confident. Mann (1959) includes masculinity, dominance, adjustment, conservatism and extroversion in his list of traits. It is clear, as shown in figure 1 below, that different researchers have proposed different traits and there is no consistency in trait theories. Kirkpatrick and Locke (1991) state that no traits are universally associated with effective leadership and argue that situational factors are also influential. These researchers state that traits only provide the potential for leadership and additional factors including skills, vision and implanting the vision are necessary for effective leadership. Other researchers have also argued that trait theories have failed to consider situational nature of leadership (Zaccaro, 2007; Vroom and Jago, 2007). These researchers have argued that situational variables impact on leader behaviour, effectiveness and consequences. According to Derue et al (2011) criticism of leader-trait paradigm has led to the development of behavioural theories of leadership which assume that leadership capability is not inherent, but can be learned. Storey (2004) states that important behavioural studies include Ohio State University, which is credited with developing the Leader’s Behaviour Description Questionnaire, University of Michigan (Katz and Khan, 1978; Likert, 1961) and Blake and Mouton (1964). Behavioural theories as advocated by these researchers identified four styles of leadership behaviour: concern for tasks (production or output), concern for people, directive leadership and participative leadership. Blake and Mouton (1964) developed the Managerial Grid which identifies five theories of managerial behaviour which are based on two variables, concern for production and concern for people. The combination of these variables results in different styles of management as shown in figure 2 below. Each style is expressed on a scale ranging from 1-9, with 1 representing minimal concern and 9 representing maximal concern. Blake and Mouton (1964) argue that it is possible for managers to learn in a classroom and revise their practices and procedures thereby moving towards an ideal 9, 9 (team management) organisational environment. Bryman (2013) has criticised the Management Grid for its emphasis on one best way of managing organisations. This researcher also claims that empirical studies have produced mixed results on the effectiveness of the Grid and argues that there is need to have information on other variables such as management and organisation change programs before definitive conclusions can be made on the effectiveness of the model. Another criticism of behavioural theories is that they do not offer guidance on what constitutes effective leadership in different situations (Bolden, Gosling, Marturano and Dennison, 2003). Kilmann and Thomas (1977) have also criticised the validity and reliability of instruments used in behavioural theories and Vroom and Jago (2007: 19) also state that behavioural models advocated by the Ohio State University and the University of Michigan have never produced “a solid body of scientific evidence sufficient to guide practice.” Additionally, these researchers also state that these theories neglected the significance of situational variables and their impacts on leadership behaviour. According to Gill (2011) contingency theories suggest there is no one best way of leadership because successful leaders use different styles depending on the nature of the situation and the followers. This means that effective leaders are flexible and have the cognitive ability to adopt a different leadership style for a given situation. Storey (2004) states that proponents of cognitive theories include Fiedler (1967), Vroom and Yetton (1973), Yukl (2002) and Hershey and Blanchard (1984). Other behavioural leadership theories include path-goal theory, leadership substitutes theory and normative contingency theory (McClesky, 2014). Fiedler’s (1967) two factor model divides leaders into relationship motivated and task motivated groups and suggests that leaders should be placed in the situation which is favourable to their style. 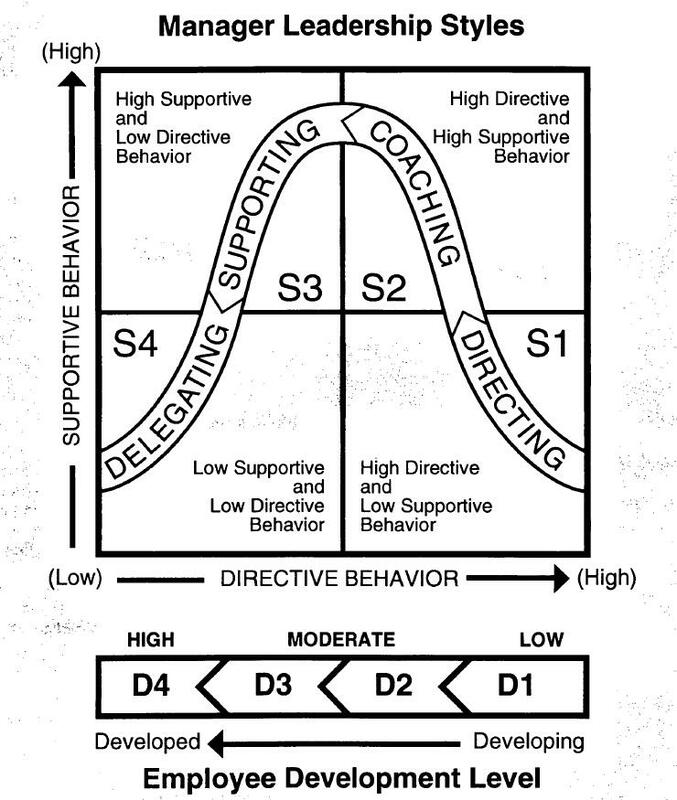 Hershey and Blanchard (1984) present four leadership styles including directive, consultative, participating and delegating which are related to the readiness (maturity) of followers, for instance, leaders will adopt a directive style in a situation where followers lack readiness or the ability and confidence to perform a task. As the employees gain ability and become more confident, the leader will adopt a participating and delegating style. In other words, the level of follower maturity (job and psychological) determines the correct style of leadership. Figure 3 below shows the situational leadership model. Gill (2011) claims that contingency theories like Fiedler’s (1967) model and path-goal theory which develops Fielders contingency theory have been criticised for inconsistent results and measuring problems. McClesky (2014) similarly states that situational leadership theory (Hershey and Blanchard, 1984) has flaws related to consistency, continuity and conformity. McClesky (2014) also states that research shows that there is no style of leadership that is universally effective and leadership types were abstract and hard to identify. Lorsch (2010) argues that contingency theories are focused on leaderships in primary groups and ignore leadership in larger organisations. Lorsch (2010) also states that contingency theories assume that one type of leadership can fit all situations and this is not plausible, for instance, the leader of an army platoon would have different leadership challenges than a sales manager or a CEO or even a senior partner in a law firm. According to Storey (2004), the 1980’s saw the development of new leadership theories promoting the concept of transformation, visionary, charismatic and inspirational leadership. Bass (1985, 1991) presents a model of transformation and transaction leadership which has three dimensions of transactional leadership, namely, contingent reward, management by exception (active) and management by exception passive) and four dimensions for transformation leadership, namely, charisma , inspiration, intellectual stimulation and individualised consideration. 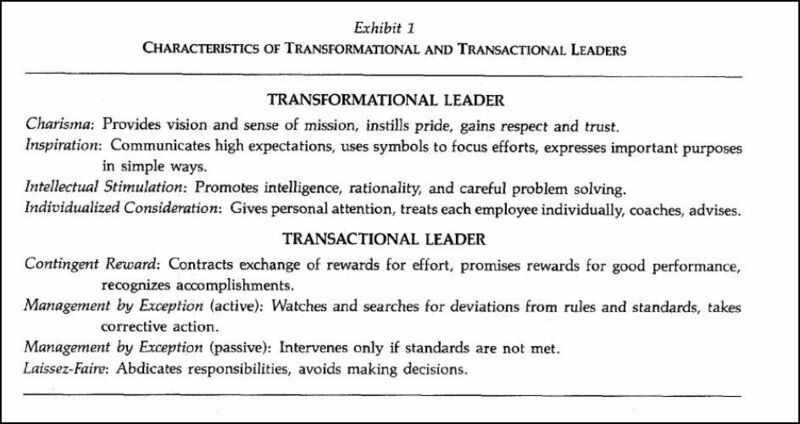 The characteristics of transformational and transactional leaders are shown in figure 4 below. Bass (1999: 10) defines transactional leadership as “the exchange relationship between leader and follower to meet their own self interests”. Kunhert and Lewis (1987) state that this simply means that transactional leaders give followers something they want in return for leaders getting what they want. Bass (1999) states that this exchange may take the form of the leader clarifying through direction or participation what the follower needs to do in order to be rewarded for the effort (contingency reward) or taking an active or passive role in monitoring and correcting follower performance. Proponents of transformational theory including Bass (1985, 1991) and Avolio and Bass (1995) define transformational leadership in terms of the leader’s effects on followers and argue that transformative leaders have exceptional influence over followers whose feelings of trust, admiration, trust and loyalty towards the leader motivates them to make self-sacrifices, commit to difficult objectives and achieve much more than is expected of them. Bass (1991) states that transformative leaders are able to achieve these results through behaviours including individualised consideration, intellectual stimulation, charisma and inspirational motivation. Shamir, House and Arthur (1993) refer to transformation theories as charismatic theories and argue that they emphasise different leader behaviour than that emphasised by earlier theories of organisational leadership. These researchers state that while earlier theories focused on leader/follower exchange relationships, providing direction, support and reinforcement behaviours, charismatic theories emphasise symbolic leader behaviour, visionary and inspirational messages, non verbal communication and appeal to ideological values. Transactional leadership differs from transformational leadership in the leader/ follower exchange relationship, with transformational leadership inspiring followers to move beyond self interests to collective interests and to do more than was originally expected (Hartog, Muijen and Koopman, 1997). Bass (1999) argues that transformational leadership builds on from transactional leadership and states that “changes in the marketplace and workforce over the two decades have resulted in the need for leaders to become more transformational and less transactional if they were to remain effective” (Bass, 1999: 9). Kunhert and Lewis (1987) state that Bass’s (1985) model of transactional and transformation leadership is based on the model developed by Burns (1978) and argue that this model lacks an explanation of the internal processes which lead to the development of the actions of transformational and transactional leaders, in other words, neither Burns (1978) or Bass (1985) has “provided a framework for understanding the motivational states or personality differences that give rise to these two types of leadership” (Kunhert and Lewis, 1987: 648). This is a weakness that has been identified by other researchers including Shamir, House and Arthur (1993) and Yukl (1999). Shamir, House and Arthur (1993) state that existing motivational theories such as exchange theories, reinforcement theories and cognitive theories cannot be used to explain the claims that a variety of behaviours can transform follower behaviour from self-interests to collective interests. Yukl (1999) also states that weaknesses of transformational leadership theory includes ambiguous constructs, narrow focus on dyadic processes, omission of some relevant behaviours, insufficient specification of limiting conditions and a bias towards heroic conceptions of leadership. Rafferty and Griffin (2004) also argue that despite the popularity of transformational theories, there are concerns regarding the definition of the sub-dimensions of the model and these concerns have resulted in empirical research providing mixed support for the differentiation of the components of the model. Researchers have also highlighted problems with the operationalisation of the concepts of the Multifactor Leadership Questionnaire (MLQ) which has been developed to measure transformational leadership (Hartog, Muijen and Koopman, 1997). 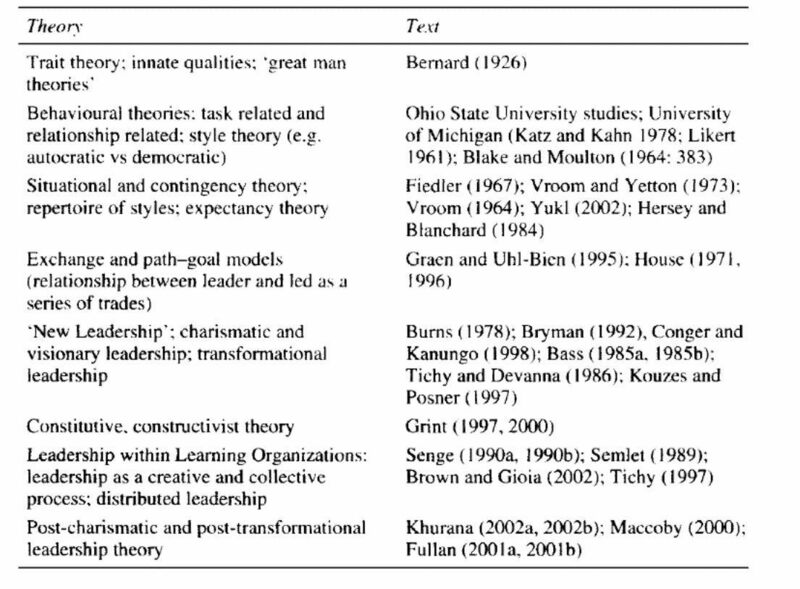 A review of leadership theories shows a progression from great man and trait theories to new leadership theories including transformation and transaction theories. Research shows that each of these theories has its strengths and weaknesses and there is no ideal leadership theory. Avolio, B. and Bass, B. (1995). Individual consideration viewed at multiple levels of analysis: A multi-level framework for examining the diffusion of transformational leadership. The Leadership Quarterly, 6(2), pp.199-218. Bass, B. (1999). Two Decades of Research and Development in Transformational Leadership. European Journal of Work and Organizational Psychology, 8(1), pp.9-32. Blake, R. and Mouton, J. (1964). 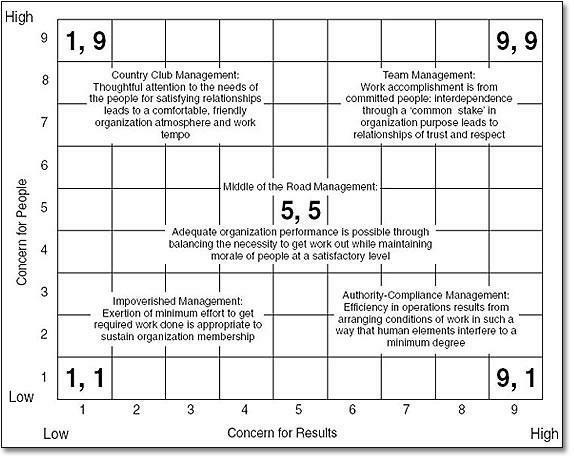 The managerial grid: key orientations for achieving production through people. Houston, Tex. : Gulf Pub. Co.
Blanchard, K., Zigarmi, D. and Nelson, R. (1993). Situational Leadership(R) After 25 Years: A Retrospective. Journal of Leadership & Organizational Studies, 1(1), pp.21-36. Bryman, A. (2013). Leadership and organizations. London: Routledge. Gill, R. (2011). Theory and practice of leadership. London: SAGE. Hersey, P. and Blanchard,, K. (1984). The situational leader. Center for Leadership Studies.House, R. and Aditya, R. (1997). The Social Scientific Study of Leadership: Quo Vadis?. Journal of Management, 23(3), pp.409-473. Hartog, D., Muijen, J. and Koopman, P. (1997). Transactional versus transformational leadership: An analysis of the MLQ. Journal of Occupational and Organizational Psychology, 70(1), pp.19-34. Hoffman, B., Woehr, D., Maldagen-Youngjohn, R. and Lyons, B. (2011). Great man or great myth? A quantitative review of the relationship between individual differences and leader effectiveness. Journal of Occupational and Organizational Psychology, 84(2), pp.347-381. Judge, T., Bono, J., Ilies, R. and Gerhardt, M. (2002). Personality and leadership: A qualitative and quantitative review. Journal of Applied Psychology, 87(4), pp.765-780. Judge, T., Piccolo, R. and Kosalka, T. (2009). The bright and dark sides of leader traits: A review and theoretical extension of the leader trait paradigm. The Leadership Quarterly, 20(6), pp.855-875. Katz, D. and Kahn, R. (1978). The social psychology of organizations. New York: Wiley. Kirkpatrick, S. and Locke, E. (1991). Leadership: do traits matter?. Executive, 5(2), pp.48-60. Kilmann, R. and Thomas, K. (1977). Developing a Forced-Choice Measure of Conflict-Handling Behavior: The “Mode” Instrument. Educational and Psychological Measurement, 37(2), pp.309-325. Kuhnert, K. and Lewis, P. (1987). Transactional and Transformational Leadership: A Constructive/Developmental Analysis. Academy of Management Review, 12(4), pp.648-657. Lieberson, S. and O’Connor, J. (1972). Leadership and Organizational Performance: A Study of Large Corporations. American Sociological Review, 37(2), p.117. Mann, R. (1959). A review of the relationships between personality and performance in small groups. Psychological Bulletin, 56(4), pp.241-270. McCleskey, J. (2014). Emotional intelligence and leadership. International Journal of Organizational Analysis, 22(1), pp.76-93. Rafferty, A. and Griffin, M. (2004). Dimensions of transformational leadership: Conceptual and empirical extensions. The Leadership Quarterly, 15(3), pp.329-354. Shamir, B., House, R. and Arthur, M. (1993). The Motivational Effects of Charismatic Leadership: A Self-Concept Based Theory. Organization Science, 4(4), pp.577-594. Storey, J. (2004). Leadership in organizations. London: Routledge. Vroom, V. and Jago, A. (2007). The role of the situation in leadership. American Psychologist, 62(1), pp.17-24. Vroom, V. and Yetton, P. (1973). Leadership and decision-making. [Pittsburgh]: University of Pittsburgh Press. Yukl, G. (1999). An evaluation of conceptual weaknesses in transformational and charismatic leadership theories. The Leadership Quarterly, 10(2), pp.285-305. Yukl, G. (2002). Leadership in organizations. Upper Saddle River, NJ: Prentice Hall. Zaccaro, S. (2007). Trait-based perspectives of leadership. American Psychologist, 62(1), pp.6-16.